Why is "1001 Ways To Reward Employees", with over 1.4 million copies in print, such an extraordinary bestseller? Because a little over ten years ago Bob Nelson took the seeds of an idea and turned it into something indispensable for business. The idea? That it's not a raise that motivates an employee, and it's not a promotion-what really sparks a person to perform are those intangible, unexpected gestures that signify real appreciation for a job well done. 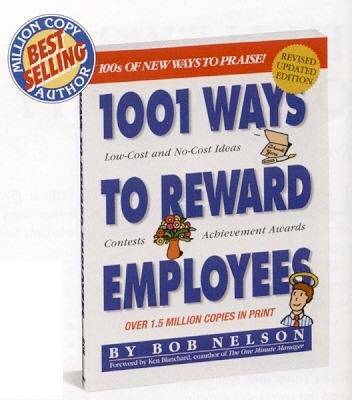 Now, after having worked with thousands of organizations in the years since "1001 WAYS TO REWARD..." was first published, Bob Nelson presents a second edition packed with hundreds of new ideas and examples of how companies are using rewards and recognitions to boost productivity and keep their valued employees happy. Airplane mechanics are rewarded with balloons and pinwheels. Another manager calls his employees' mothers and thanks them for raising such industrious children. There are ideas from the offbeat (The Margarita Award) to the company-wide (a quiet room) to the embarrassingly simple (a hand-written thank you note) to the wacky (the Laugh-a-Day challenge) to the formal (a two-week promotion to special assistant to the president). Each section includes no-cost rewards and low-cost rewards, both public and private, making this new edition an indispensable resource for making the person/achievement/reward equation work.
" The most interesting and inventive business book on the market today . . .a publishing phenomenon." " Welcome to Bob' s World: A place of above-average managers and workers, all committed to personal excellence, good will and, of course, company profits. [This book] details how a little praise goes a long way." " There' s a difference between having someone show up for work and bringing out the best thinking and initiative in each person. To do that requires treating employees more as partners, not as subordinates. Being nice isn' t just the right thing to do, it' s also the economical thing to do." "The most interesting and inventive business book on the market today . . .a publishing phenomenon." "Welcome to Bob's World: A place of above-average managers and workers, all committed to personal excellence, good will and, of course, company profits. [This book] details how a little praise goes a long way." "There's a difference between having someone show up for work and bringing out the best thinking and initiative in each person. To do that requires treating employees more as partners, not as subordinates. Being nice isn't just the right thing to do, it's also the economical thing to do."